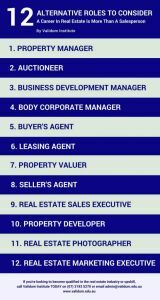 When starting a career in real estate, people usually only consider stepping into the role of Salesperson. But, there are in fact many different career paths you can take in this industry. We discuss some of the various roles’ required responsibilities, skills, and attributes to help you decide which path is right for you. Property Managers lease and manage residential, commercial, retail and industrial property on behalf of property owners. Their main tasks include marketing for rent properties, negotiating leases and rent renewals, selecting tenants, managing maintenance, and collecting rent. If you have great people, communication, and multi-tasking skills, and are organised and detail-orientated, this is the perfect role for you. Auctioneers carry out public property sales. In this role, you are responsible for explaining contracts, selling property features, answering prospective buyers’ questions, and calling bids. It is a great career path for individuals who ooze charisma and confidence, are natural entertainers and excellent communicators. Business Development Managers oversee a real estate agency’s new business initiatives. Their main responsibilities include growing the rent role, marketing for lease properties and liaising with property owners when marketing their properties. This role is best suited to individuals who are business savvy, enjoy networking and thrive on the challenge of achieving KPIs. Like Property Managers, Body Corporate Managers take care of their assigned area (known as ‘common property’). In this role, you must attend meetings, distribute minutes, collect funds, manage maintenance, organise insurance, and remain up-to-date on relevant legislation. You should consider this role if you are a great communicator, easily approachable, and can confidently mediate between people. Buyer’s Agents act on behalf of buyers. As property consultants, Buyer’s Agents are responsible for finding the most suitable properties for their buyers and representing their clients throughout the buying process. This is a great career path for individuals who are self-motivated, possess strong negotiation skills, and enjoy being the advisor. Leasing Agents find the right tenants for their clients’ properties. Their main tasks include navigating the property market and managing leases. Like a Property Manager, they must be knowledgeable of their market area and understand current trends. If you have excellent interpersonal and problem-solving skills, and thrive on working with people and property, this is the perfect role for you. Property Valuers determine the value of properties based upon market conditions. In this role, you are responsible for assessing the value of assets, mortgages, rent and for sale properties, calculating stamp duty, municipal rates, and land tax, and evaluating insurance compensation. This role is best suited to individuals who enjoy working with numbers, are excellent problem-solvers and critical thinkers. 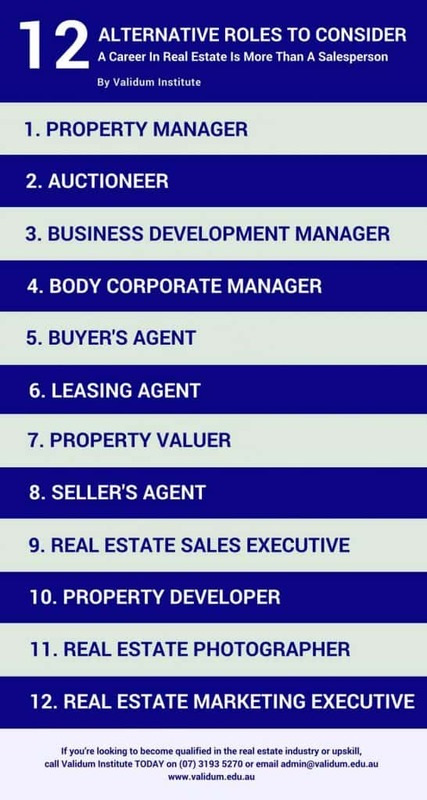 These are only some of the various roles you can consider if you want to start a career in real estate. Other career paths include Real Estate Sales Executive, Seller’s Agent, Writer, Photographer, Marketing Executive and Property Developer, which we will cover in another article. You should weigh up each role’s required responsibilities, skills and attributes against your own experience, skills, and personality, to determine which role is right for you. If you’re looking to become qualified in the real estate industry or upskill your real estate qualifications, call Validum Institute TODAY on (07) 3193 5270 to find out more about our fresh new blended approach to learning. 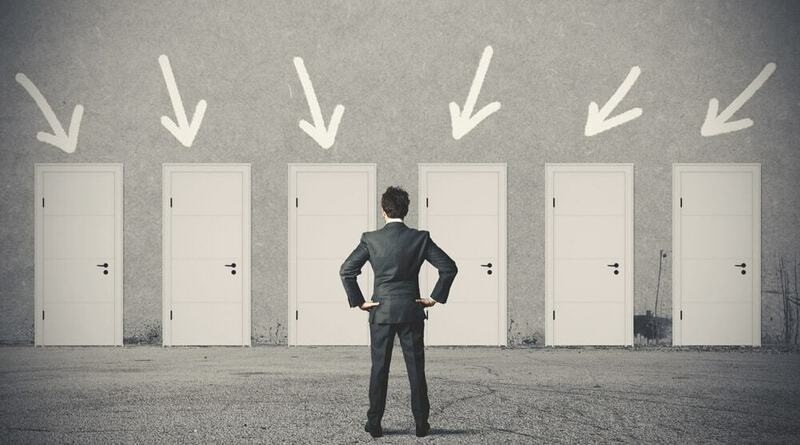 We’d love to know which real estate role you think is right for you. Email me your thoughts at victor.james@validumgroup.com.au.